Canvas has been wrapped around stretcher bars with hand-painted edges. The artwork need no frame & arrive at your door ready to hang! Painting has a protective topcoat that allows wet cleaning with a soft moist cloth. 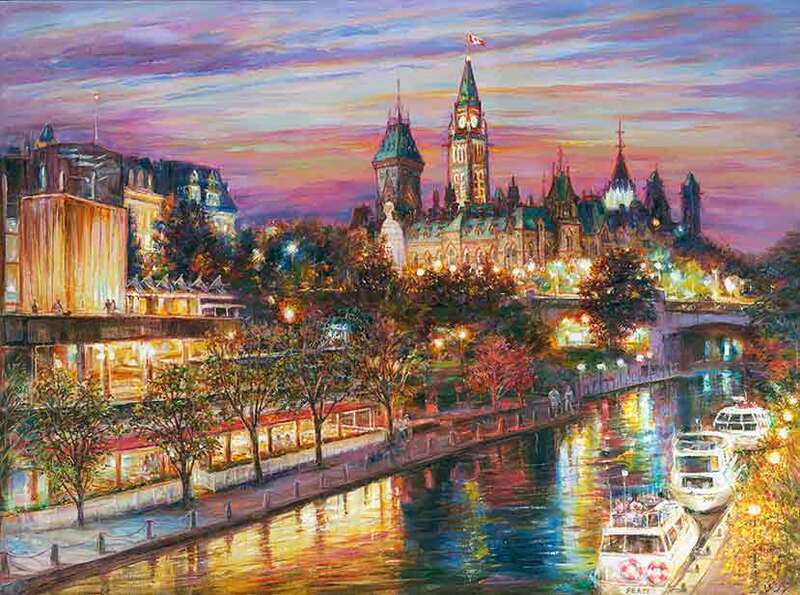 Description: Romantic Ottawa Night - original art painting was created with intention to bring more Good Luck to your life. Artist uses Feng Shui principles in here work. Seven similar elements and a hidden owl figure in her romantic landscapes, with the number 7 representing a good luck and prosperity, and the owl - wisdom. Rideau Canal, summer, reflections in water, private boats on Rideau Canal in Ottawa downtown are on the painting. Peace Tower, Parliament buildings and National Art Center are on the background. The painting is the awesome gift for Housewarmings, Weddings, Engagements, Valentine's Day, Birthdays, Holiday, Christmas, Graduation, any romantic occasion or a magnificent and exciting treat for yourself. It's so good for your home or office unique decor.